A deeply enriching blend of 9 essential oils with Evening Primrose. Helps maintain the lipid skin barrier and reduce visible signs of aging. Transforms dry, dull legs into shiny, soft skin. 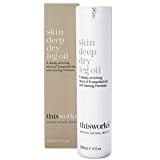 Providing some much needed care and attention to the undernourished skin on the legs, the Skin Deep Dry Leg Oil provides a dramatic transformation for dry, dull skin, offering an intensely hydrating and nourishing formula that soothes and enhances the appearance of the skin with a blend of 9 essential oils, including rose, tuberose, sandalwood and evening primrose. To use: Massage into the legs, after showering or bathing.